Our last ‘Toucaneers” to join the boat were Geoff and Mia Sherman, arriving in Kingstown, St Vincent on Sunday 4th January. They’d booked a hotel for a couple of nights in case we were held up and I’m sure would have been happy to wait there for us even longer if necessary. However, the strong trade winds and high seas showed no sign of abating until at least a week later, so after a ‘Team Toucan’ meeting we decided to head off from St Lucia on Sunday morning with 3 reefs in the main and a tiny scrap of headsail for the 30NM passage between the islands. 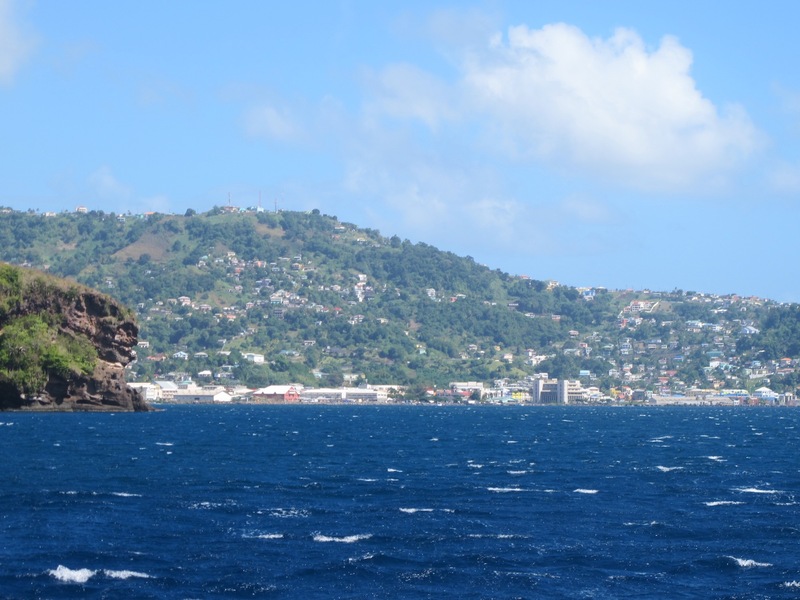 Don’t ask me why, but this particular stretch of water between St Lucia and St Vincent is notorious for being rough and bouncy and we weren’t disappointed! Once out of the lee of St Lucia we were getting 25 kts gusting to 30kts, with large swells coming straight across the Atlantic from Africa, right on our beam, not the most comfortable ride for a catamaran. Luckily the wind was on our quarter so we were more fortunate than the numerous charter boats we saw coming the other way, pounding their way to windward to get back to their base. 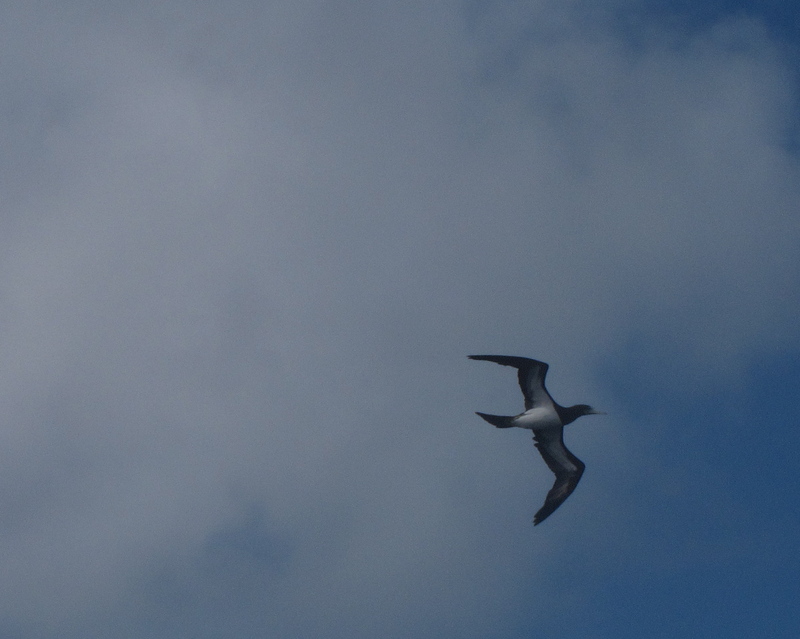 We found that the 3 reefs weren’t giving us enough forward momentum, so we went back to 2 reefs and rocked and rolled our way to St Vincent, watching the frigate birds, shearwaters and brown boobies swooping on the flying fish that we flushed out of the waves. Of course, when you have died-in-the-wool racers aboard there’s no such thing as ‘cruising’, so the challenge was to overhaul the cat that had left the anchorage 20 minutes ahead of us (we did) and keep those numbers high on the speedo. Rob was holding the record at 12.8 kts until Bruce snatched victory from him at the last moment by surfing down the front of a wave at 14.4 kts. And Ron got the record for managing to wet every single person in the cockpit! He also took the prize for briefly turning a catamaran into a monohull as we slid down the side of wave sending everything tumbling off the cockpit table! Despite the challenging conditions, we continue to be impressed with how Toucan handles the rough stuff, although I’m not sure that Penny and Jackie were quite as impressed. 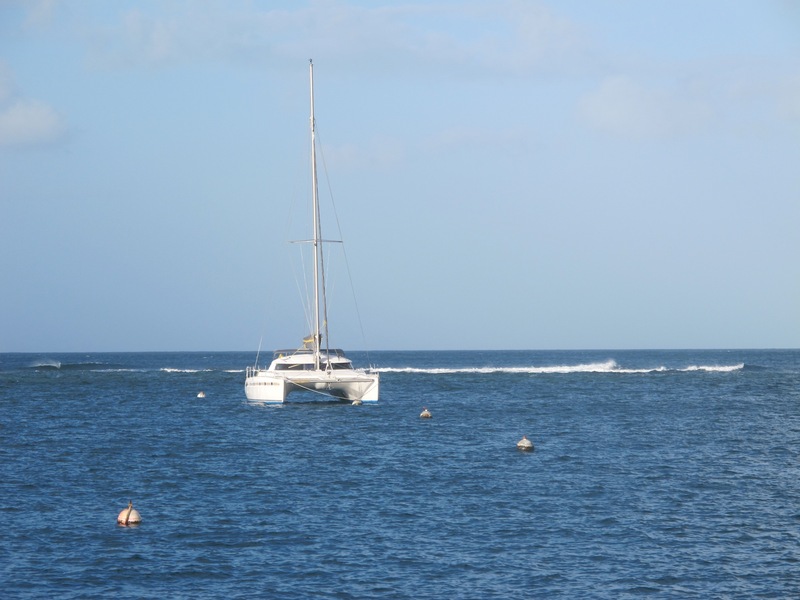 It certainly wasn’t the pleasant trade wind sailing that most people expect on a Caribbean cruise! Once we got into the lee of St Vincent things calmed down, but there were still some challenges ahead, namely where to clear in and where to anchor. St Vincent only has 3 ports of entry where you can clear customs. The first, Chateaubelair wasn’t open on Sundays and also has a very poor safety record as an anchorage, so we made for Wallilabou where our guide book said clearance was available every day between 5-6pm. As we entered the small little bay we were approached by the inevitable ‘boat boy’ who tried to convince us to take a mooring that would have placed us perilously close to other boats and a rickety wharf. We declined and scouted out the next bay but that too looked uninviting. Further south, Kingstown, the capital, was the remaining port of clearance but again not safe and apparently extremely difficult and laborious to clear into. We’d arranged to meet Geoff and Mia at the Blue Lagoon, just south of Kingstown near the airport so we decided to keep going, take a mooring there and then Bruce would get a taxi back to Kingstown to clear in. A bit more research in our trusty guide book and we discovered that Sam’s Taxi Service was a one-stop yacht service, offering not just taxis but moorings, laundry, gas bottle refills and yacht clearance. At US$80 it wasn’t cheap, but between 6 of us it seemed worth it to avoid the hassle of clearing in ourselves. So after coming through the narrow entrance to the lagoon and picking up a mooring, Bruce dinghied over to the marina to meet the delightfully named Hyacinth from Sam’s Taxi Service who took all our papers and passports to Kingstown. There was a bit of a hitch because we hadn’t received the exit clearance papers from St Lucia that apparently we were supposed to have, so even though our passports had been stamped on departure we came under close scrutiny. The customs officer rang us wanting proof of ownership so after a bit of a frantic dig in our records we found several documents that finally seemed to appease her. Now legally in the country and a bit tired from our passage-making we had an early night and looked forward to welcoming the Shermans aboard Toucan the next day. Haha – love the squawkometer Linda, we all had a good laugh at that! I think it might be going off a few more times yet!